Steelpointe Harbor is an urban-oriented, mixed-use development designed to embody the most desirable characteristics of a harbor-side neighborhood. A combined effort between the City of Bridgeport and developer Bridgeport Landing Development, LLC- plans for the new Steelpointe Harbor development including 1,500 residential units, 800,000 square feet of retail, 200,000 square feet of commercial/office space, and 300,000 square feet of hotel / meeting area overlooking a 200-slip marina with complete shore-side support. Steelpointe Harbor will be a new urban waterfront neighborhood consisting of a network of attractive streets, open parks, water views and a public harbor walk. Our mix of residential, restaurant, and retail uses reflects a diverse, livable, pedestrian-friendly environment consistent with the design goals of the Park City. A tree-lined East Main Street will continue to serve as the connection between the neighborhoods north of I-95 and the revitalized Stratford Avenue corridor, extending to the waterfront Harbor Walk and the Steelpointe Harbor Marina. 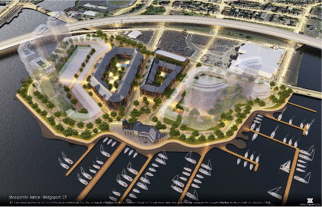 East Main Street will connect with the public access Harborwalk adjacent to the DockMaster Building. The Harborwalk will be a public space connecting to retail shops, restaurants, the marina, a park, and most importantly, it will provide public waterfront access to a panoramic view of the harbor. The hierarchy of public spaces along East Main Street ranges in scale from this unifying grand open piazza, to smaller spaces for outdoor café and restaurant seating, to the more intimate strolling and shopping sidewalk realm serving retail patrons. The development of an attractive and vibrant network of pedestrian-friendly streets has evolved through a careful study of the relationships between appropriately scaled buildings, blocks, sidewalks, on-street and streetscape amenities. Urban furniture for passive recreation as well as lighting, signage, awnings and special paving make up the balance of a well-designed and stimulating street environment. Residential streets and courts in particular are composed of low, mid and high-rise structures to give the neighborhood both a contained sense of intimacy and an iconic feeling of drama. Off street parking and service areas are located behind the major building structures, within the structures or screened from view. Pedestrian connections from parking areas to public spaces, or from dockside to public space, retail and residential uses are achieved through proper landscaping and sidewalks. The smaller scale of these features provides a comfortable transition from the car to the shopping streets and public promenades. Overall the development at Steelpointe Harbor aims to bring residents and visitors back to the waterfront through designated live, work, and play spaces. Greenery, open park space, and scenic harbor views will work together with the thoughtfully designed new built environment to achieve this vision of a complete new and inviting harbor-side community. Shipbuilding began on the banks of this area in the early 1700’s and by the late 1800’s, the peninsula was booming with commerce. 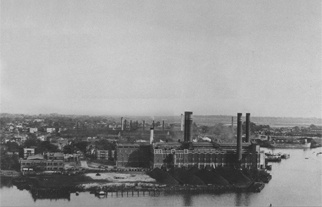 The name “Steel Point” is derived from “Bridgeport Steel Works” that was at one time located at this site. In the 1900’s, Steel Point was home to marinas, shellfish and maritime businesses, and the residences of those who sailed the sound and the trades that supported them. The City of Bridgeport spent the past several decades preparing the area now known as Steelpointe Harbor for development. 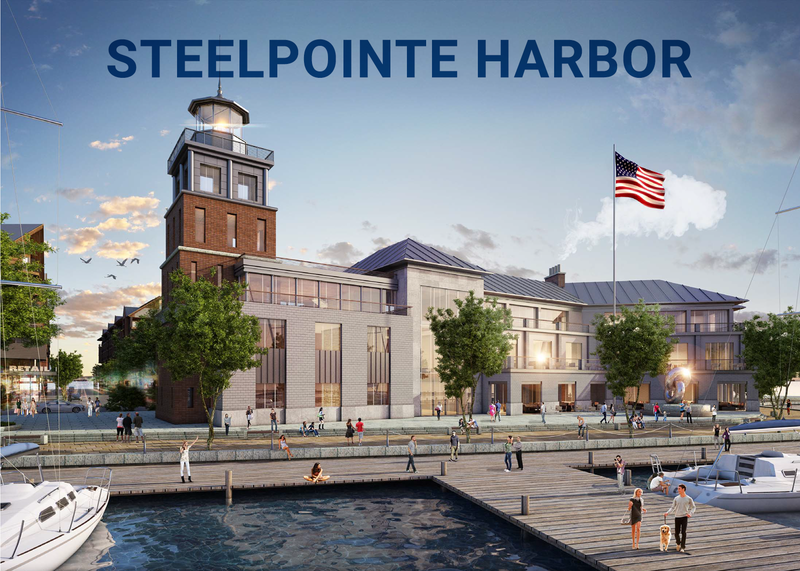 Steelpointe Harbor is the rebirth of a past engine of water dependent and water related commerce essential to the future development of the largest city in the State of Connecticut. Steelpointe is bordered by the Yellow Mill Channel to the east and the Pequonnock River to the west with the Long Island Sound on its southern edge and I-95 and the city’s East Side to the north. It is an ideal location on Long Island Sound, positioned about an hour to Port Jefferson Long Island on the ferry and about an hour to New York City via Interstate-95 or the Metro North Railroad. The RCI Group and its affiliates have been developing, acquiring and managing residential and commercial real estate since the early 1970’s. During that period, the RCI Group has acquired, managed and in some cases sold over 11,290 apartment units, 1.9 million square feet of retail, office & commercial buildings and developed over 16 marina locations with over 2,095 boat slips together with appropriate related ancillary services. As a result of its diverse experience, the RCI Group is highly regarded for its ability to develop strategic waterfront destinations, tailored to fit and address the needs of the adjacent upland communities. 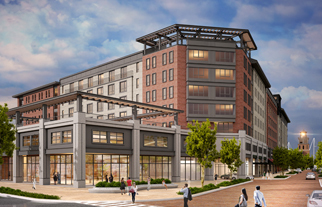 The RCI Group created Bridgeport Landing Development (BLD) as the entity to manage the Bridgeport project. The RCI Group and BLD are supporting Steelpointe Harbor with additional adjacent harbor side development, funding for affordable housing, community philanthropy, and other local neighborhood community engagement projects. Through its staff and representatives, BLD is active in the community and fully engaged with local initiatives. 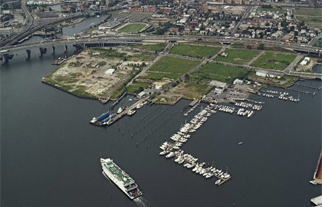 Since acquiring the 52 acres for the Steelpointe Harbor Project, the RCI group has acquired an additional 48 acres on the Eastern Side of Bridgeport Harbor. Bridgeport Boat works will open in 2018. It is a full service shipyard that will complement the Marina on Steelpointe, service the marine industry, and provide local jobs. Future plans for additional harbor side development include the development of a world class 1.4 million square foot tourism destination in partnership with MGM International.